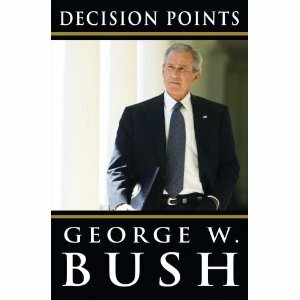 At the recommendation of my parents, I’ve started reading “Decision Points”, President Bush’s autobiography. I’ve enjoyed it more than I expected to. It paints a picture of a well-intentioned guy doing what he thought was right in tough circumstances and occasionally getting it wrong. I find this view of President Bush more appealing than either of the common liberal caricatures of him (those being either an evil genius trying to destroy the world or a bumbling idiot completely out of his depth). Each chapter focuses on an important decision he made during his two-term Presidency. One of these concerned his stem cell research policy and made a few references to his policy towards science as a whole. Since liberals considered his science policies so bad that incoming-President Obama references “restoring science to it’s rightful place” in his inauguration speech, I was curious to hear President Bush’s side of the story. Although the chapter starts with a reference to “Brave New World” and makes frequent use of the slippery-slope argument (i.e. “doing this may not be so bad, but it might open the door to something worse) that makes intellectuals roll their eyes, I thought that President Bush did a reasonably good job explaining the basic science of stem cells and summarizing the pro-research side. He acknowledged that many of the embryos were “leftovers” from IVF clinics and would likely be discarded anyway, he referenced conservative icons like Nancy Reagan and Orrin Hatch who supported stem cell research, and he even quoted an article from Science that claimed “if we spurn embryonic stem cell research, not more more baby is likely to be born. If we conduct research, we may relieve suffering”. He then explained the arguments against stem cell research, all of which came from the religious far-right, an important part of his political base. Many of these people claimed that destroying a human embryo intentionally, even one that was going to be thrown away, was stepping over some sort of moral line. He also references “snowflake babies”, the ultra-rare result of implanting a leftover IVF embryo that would otherwise be discarded into another mother as proof that the embryos conceivably could result in the birth of a human being. He (and many in the anti-stem cell crowd) frequently claim that “the science is unproven” as if it’s some important point. Well, duh, that’s why we want to do research on it. You don’t generally do basic research on something that you already know is true. This provided a fascinating insight into his thought processes. By his own admission, stem cell research had bipartisan support, had enormous potential to cure diseases affecting millions of people, and likely wouldn’t result in very many fewer human births (if any at all). The opposition to the policy came from one particular interest group in one party. What President Bush eventually decided to do was to allow Federal funding for stem cell research on already-developed stem cell lines while banning Federal funding for research that created new lines. He felt that this was a reasonable compromise, but advocacy groups on both sides of the issue were furious (which, I suppose, is one definition of the word “compromise”). When Congress later sent him a bill that would Federally fund the creation of new stem cell lines (which would involve destroying embryos), it was vetoed- the first time President Bush vetoed anything at all. He points out that “many of the first to turn against the policy were scientists”. Personally, if the people who know the most about an issue don’t support your policy focusing on that issue, it might cause me to reconsider that policy. President Bush instead blamed the scientist’s greed, saying “by providing some Federal funding, I had whetted their appetite for more…it did not satisfy the scientists, who constantly demanded more”. He also criticizes those who considered his restricted funding and veto of a pro-research bill a “ban on embryonic stem cell research”, saying “on the contrary, I was the first President in history to fund embryonic stem cell research”. This argument is a little silly since the technology didn’t exist until a year and a half before his first term, and this is a largely semantic argument, but I suppose I see his point. Finally, he criticized John Kerry for “labeling my positions as anti-science” since “I had supported science by funding alternative stem cell research, promoting clean energy development, increasing federal spending on technology and research, and launching a global AIDS initiative”. Despite President Bush’s whitewashing of his scientific record (and several other policies), I would encourage everyone to read this book. It won’t make you agree with him- in fact, I occasionally found myself yelling at the book. If probably won’t make you like him. It will, however, allow you to understand his decision-making process, an exercise which I simultaneously found infuriating and fascinating.